Yes, Coca-Cola tastes like the American Flag looks, but there's always room for improvement (like, what if our flag had little moons instead of stars? just spitballing here). And if you can't actually improve, you might as well try something different -- because that will at least distract you from Sisyphus-like repetition of -- well, anyway, the point is there's a new soda. Coke has just announced its first new flavor in over a decade: Orange Vanilla. 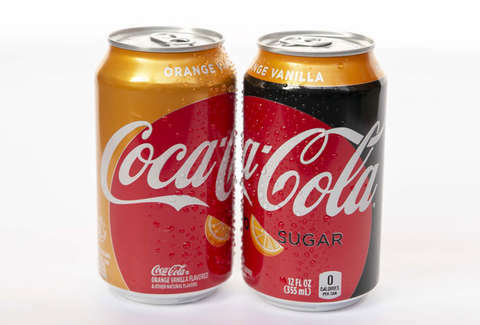 It'll be available both as Orange Vanilla Coke and Orange Vanilla Coke Zero Sugar. Starting on February 25, the soft drinks will appear in 12-ounce cans and 20-ounce bottles, and from March through May, you can get them in those 12-ounce skinny cans. "We wanted to bring back positive memories of carefree summer days," brand director Kate Carpenter said in a press release. "That’s why we leaned into the orange-vanilla flavor combination -- which is reminiscent of the creamy orange popsicles we grew up loving, but in a classically Coke way." This is the first new Coke flavor since Vanilla Coke hit the market in 2007. Raspberry, lemon, and ginger were also considered, but this feels like the right choice, don't you think? So... let's talk about that moon flag.